It was a crisp, fall night in the lands of Wolfing and the pack members were already getting in the Halloween spirit. Many were already preparing for their costumes and others were decorating the lands. It was a truly peaceful night and everyone was happy and getting along. However, there was something truly unusual about tonight. With all the fun and laughter that echoed from the pack members, they slowly started to realize there was one that was not among them... But who could it be? Suddenly, WolfKodi entered Huddle House and gazed around, appearing to be looking for something or someone. "What are you looking for, Kodi?" One of the pack members asked, staring at the red wolf in confusion. The Alpha gazed down at his fellow pack member with a concerned look. "Has anyone seen Aqua? I haven't seen him all night." The pack members looked around and shook their head. Then, suddenly a Sentinel scurried in, panting with a lost of breath. "Alpha Kodi! I think Aqua has been captured!" Gasps and murmurs echoed throughout the pack and Kodi stared in worry. "What?! Where?!" The Sentinel panted, attempting to catch his breath and replied,"I-I think I saw him last at Misty Forest! T-Their footprints!" Without another word, Kodi and the rest of the pack quickly ran towards Misty Forest. Upon arrival, they examined the ground, looking for clues. During the territory-wide search for the elusive Alpha, one of the pack members cried out to the rest of the pack,"Look! Pawprints! But these are rather huge..." And soon enough a Gamma exclaimed,"A piece of Aqua's tail fur too!" WolfKodi examined the clues and then spoke calmly. "Lets follow this trail and see where it leads. Keep an eye out. These pawprints are not Aqua's... But maybe they'll lead to where he's at." The pack followed the trail of pawprints to only arrive at a large, stone gate with a powerful dark essence surrounding it. "What is this?" A pack member asked in awe. "Appears to be a magical barrier. Whatever it is past that gate; Aqua is in there for sure." Kodi replied, examining it thoroughly. "Hey look!" A Sentinel exclaimed. Beside the gate was a stone tablet, scripted in a weird language. "What do you think it says?" A pack member asked, tilting their head, puzzled by the tablet. "Appears to be instructions to break the spell on the gate." A Beta soon chipped in, examining closely and then soon turning to the crowd, with a shy smile. "I... May or may not be into this weird magic stuff." She giggled shyly. "However, I believe if we find a few of the ingredients listed in here we can break the spell. So, let me see here..." She murmured, looking back at the tablet to examine it closely. "Potions, Owl Feathers, Bones, Candy... All of it seems pretty clear except this last part. 'What matters to you most.' What could that mean?" "My favorite bone 'matters to me most'!" A pack member exclaimed with a grin. "No... Aqua! Aqua matters to us most!" Kodi exclaimed. The Beta nodded and smiled. "Then, I guess it means we must find those ingredients as well as items that belong to Aqua." The pack nodded and murmured in agreement. "Then what are we waiting for? Lets save Aqua!" A pack member shouted with a howl. The pack shouted and cheered in agreement; spreading out to find the ingredients and save Aqua! Here's the Plan: Aqua has been kidnapped by someone or something. We have found where he may be at however, there's a powerful spell on the gate leading to him. According to the instructions, we must find certain items along Wolfing territory to break the spell. Each item has more power than others so, some may be difficult to find while others are easier. 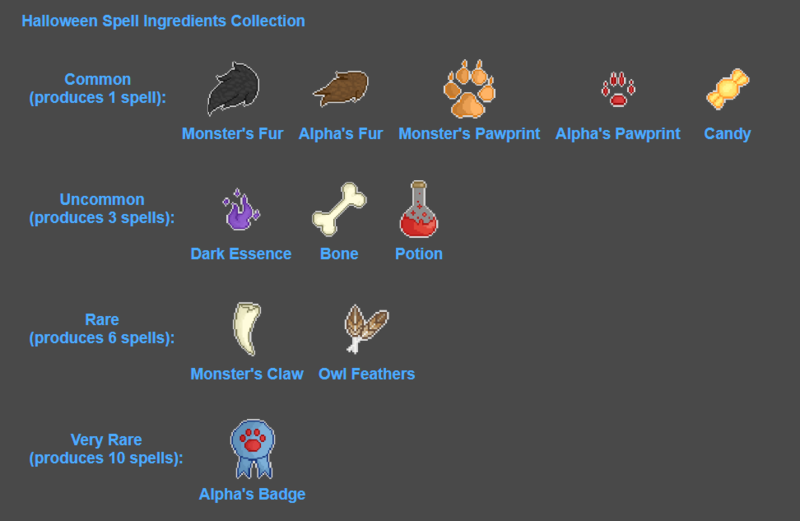 You can view how many ingredients you have collected through your spell ingredients collection. Once we have created 10,000 Spells we can unlock the room to where Aqua is held captive and save him! Lets save Aqua! Wolfing 2018 trick and treat poses credit goes to Spin and MoonMoonMoonMoonMoon, respectively. Also, in conclusion to the new event, The Event Committee would like to announce the winners to the Creature Creation Contest. First place goes to... Mug! Congratulations! You will receive artwork made by Pit as well as your creature being featured in this year's event! Our Runner-Up winner goes to... Crocodile! Congratulations! You will receive artwork made by Spin! Thank you all who participated in the Contest and Happy Hunting! Who are we saving now Aqua's no longer kidnapped nor an Alpha? Reply5Abraxiis, Niconi, Ohio, Radiomutt and Ulv a-pawed this. [3:57:21 PM] teeth: "we gotta save aqua"
Reply10SkylarTheWolf, Abraxiis, Dol, Moonstepthewolf, teeth, wolves r cool, Cats, mistake, Lee and Niconi a-pawed this. Reply5Ulv, Moonstepthewolf, Aqua, teeth and Niconi a-pawed this. Reply2Aqua and Niconi a-pawed this. Reply22SkylarTheWolf, Paintpaw, Shewolf, Taiga, TsunamiTheWolf, Moonstepthewolf, Cats, Mum, Radiomutt, teeth, derpy, Lee, DarkClaw, hoshii, mistake, Lifeline, Love, Mazikeen, Ulv, Nuclear, Mug, solis, pit and Niconi a-pawed this. Reply1Cats, teeth and lover a-pawed this.